Sacrewell works very closely with schools and colleges across the area to deliver a rich curriculum, so when the opportunity arises to make the most of their talented students, we don’t pass it up. 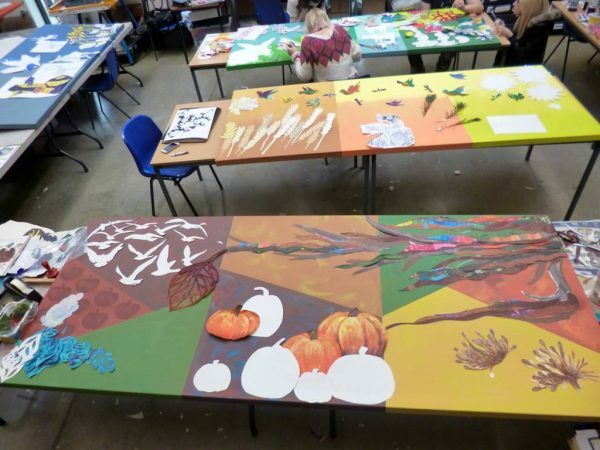 Art students at Peterborough Regional College have spent this term creating murals for our new Playbarn which reflect the seasons at Sacrewell, and will inject a bit of colour and creativity onto the walls of the barn. As we commissioned the artwork, the students will be able to use the work they have done for us in their portfolios, and as work experience. The murals should be finished by half-term.